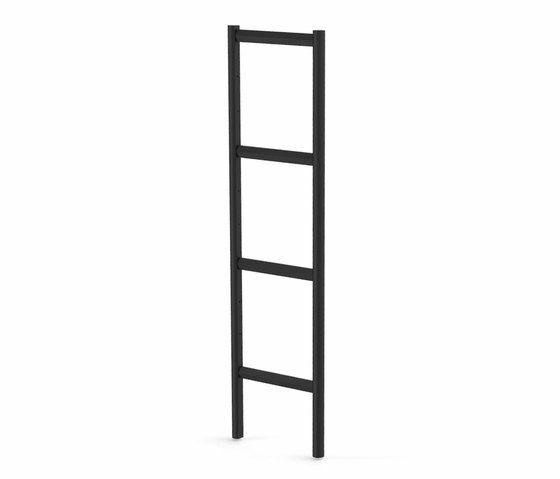 DAN is a modular collection: The essence is a black stained wooden ladder., which in itself has so many refined details you could use it as an eye-catching furniture piece, to display magazines in a living room or to hang your clothes in a bathroom. Next to the ladder there is a metal connector based on the traditional Japanese joinery, this will enable you to create larger pieces. Designed for the love of working, the choice of material, colour and form reflects Bulo's commitment to durability and multi-function. Wood is warm and natural, and its carbon footprint is virtually nothing compared to steel. Thanks to its design, you will be able to change your standard DAN desk into a standing desk just by lifting the table top a level higher. The name DAN is a reference to Japanese martial arts where it expresses skill level. The collection will grow together with you, your business and yourself, without loosing any flexibility. Since 1963, the Belgian brand Bulo has been creating furniture for work.